A.M. Ran with Jeremy and Ariel, then with the kids. Benjamin did 6, Jenny, Julia, and Joseph 2, Jacob 1. I ran total of 13 miles. A.M. Ran with Jeremy and Ariel, did 3x400 with 100 recovery in 71.8, 72.3, 72.8 then long recovery, 600 in 1:45.2, got home did 6x100 hill sprints ranging from 18.2 to 17.2, then ran with the kids. Jenny, Julia, and Joseph did 2, Jacob 1, Benjamin 6. I did total of 14 miles. A.M. Ran with Jeremy and Ariel. We did a 2 mile tempo down the canyon. The target was 6:00 pace. We went through the first mile in 5:55. Ariel faded after the first 0.75 or so. Jeremy also had a hard time in the second mile and ran it in 6:12, total time 12:07. It is interesting that they both did fine at 5:53 pace for 1.5, but when we make it 2 all of a sudden we are in a different psychological territory. We will try again next week and see if we can break this mental block. Then I came home and ran with Benjamin. We jogged 2 miles and then ran 2 miles hard coming back. Our time was 11:36.6. It is not an easy course, I had to work to keep up. Benjamin was pushing the pace most of the time except for about 500 meters after 1.5. This is a breakthrough for Benjamin. I estimate he should be running a track 5 K in a low 18:00 or a little under. 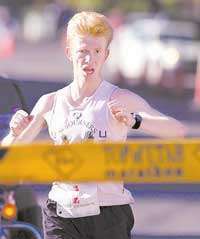 He will run the Utah Valley 10 K. The goal is to hold 6:00 pace all the way. Then ran with the other kids. Total distances were - Benjamin -6, Jenny, Julia, and Joseph 2, Jacob 1. I ran a total of 13. A.M. Ran with Jeremy and Ariel. Did a speed workout. Modified it a bit. Started with 2x400 into the canyon with 100 recovery in 78.5 and 78.1, 200 recovery, 200 in 37.3. The 200 was unplanned, I just had to catch up to Ariel and Jeremy. Then a long rest, and 2x400 out of the canyon with 100 recovery in 70.2 and 71.5. Then a long rest, and 600 in 1:41.1. On that one Jeremy and Ariel ran the first 200 with me in 33. HR was 163 in the 600. I felt awkward, like I was swimming and barely staying afloat, but nevertheless it was the fastest 600 this year. I felt like I could have gone longer, but not faster. That was 7 miles total. Then got home and did 6x100 hill sprints on my regular stretch. The splits were 17.8, 17.5, 17.2, 17.1, 16.6, 17.1. I really focused on the 16.6 and it paid off, but then I think I was too tired both physically and mentally. Then ran with the kids. Joseph wanted to do a time trial, so we drove to the Provo Canyon as doing it on our course near the house would have produced slower times. I wanted him to experience breaking 7:00. We did the mile down the canyon. He started out conservatively and complained that his pants were falling down. I told him to let the pants take care of themselves and just run since they had not fallen down yet, and if they do, so be it, he is only seven. So his first quarter was 1:48, then as his faith in the stability of the pants increased he sped up to 1:46. At this point I was not sure if it was just the pants or he was not feeling good because he kept falling behind and was not giving me five when I asked him, so I thought that there was no chance of him breaking 7:00. But then he sped up to 1:45 in the next quarter, and the 7:00 target became reachable with a strong kick. He found it and closed with 1:40 finishing in 6:59. Thus he became the fifth sub-7:00 miler in our family, and the first one to do it at the age of 7. Jacob ran with Jenny and Julia at a slower pace to where we finished, and then we all ran back together. Jacob ended up running a good time for 2 miles in his debut - 17:42, and it was an out and back course. Not bad for a 5 year old. He does have more in him, I believe. Benjamin ran an out and back 5 K in 27:25 at the age of 5 which is 8:49 average when his mile PR was 8:21, maybe he could have done 8:10. Jacob has already run 8:00.6 mile on the track. I think Jacob is faster, but less mature, so he cannot yet push himself as hard as Benjamin did at his age. So Jenny, Julia, Joseph, and Jacob ran 2 miles, Benjamin did 6, and I ended up with 13. A.M. Easy run with Jeremy and Ariel, then ran with the kids. Benjamin did 6, Jenny, Julia, and Joseph 2, and Jacob 1. I did a pickup for about 0.7 to catch up to the kids because I started late. Total of 12 miles. A.M. Ran with Ariel. He did the first 8 miles with me, then turned around. I finished the first 10 in 1:17:05 and then ran the same stretch back fast on my usual Saturday course - from the house to a few meters past mile marker 2 of the Provo River Half Marathon and then back. It was more or less a repeat of last week. I hit all my checkpoints within 5 seconds of last week splits, including the 3 mile tempo stretch in 16:57 ( 16:52 last week), which put me 3 seconds behind last week's time at 8 miles with the split of 45:24. But I was stronger in the last two miles - maybe it was from holding back a bit, maybe because this time I did not have to steeple-chase over the lady's little dog and the leash, maybe I was just stronger. Once thing I noticed is that I today I was holding a steady 5:40 over mile 9, while I was a bit slower last week even before the dog steeple-chase incident. Also I had a feeling that if you just gave me a straight flat road with no wind and with somebody to follow, I could run 5:40 pace for a while even in the zone. So I finished the last 10 miles in 57:03. No HR data today as my battery on the HRM strap died.